Artline 2-in-1 Flipchart Assorted Marker (Pack of 8) EK-325T-W8 – AR84664 – OfficeYoo! These Artline 2-in-1 Flipchart Markers feature a 2mm bullet point for bold writing, as well as a 5mm chisel tip for underlining, colouring and marking. The vivid, water based ink is designed not to bleed through for professional presentations and reports. 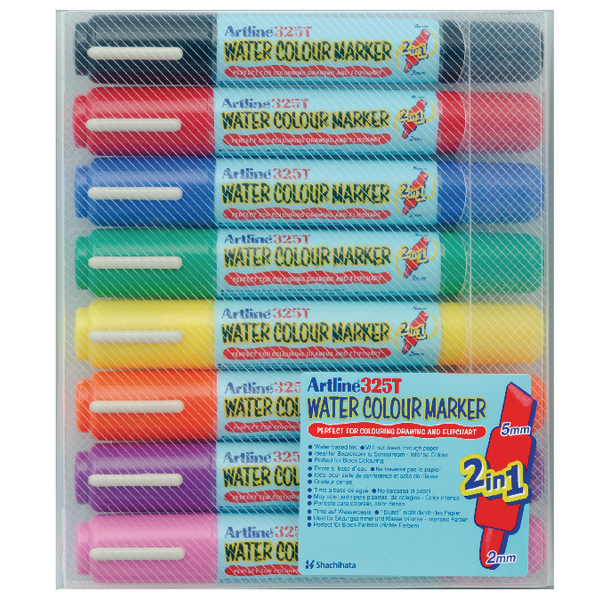 This assorted pack of 8 markers contains black, red, blue, green, yellow, orange, purple and pink.